The Star Gold Coast is being transformed into the nation’s biggest hotel. Four new towers will complete the picture at Broadbeach island, the tallest soaring 74 stories, with 3,000 hotel rooms and apartments in total, 50 restaurants and bars and state-of-the art day spas transforming The Star into the largest retail and entertainment precinct in the Southern Hemisphere. This project will create an influx of 3,000 jobs. Construction is already underway with completion slated for 2030. The Premier gave the project her tick of approval, “We now have the green light, full steam ahead, for the development of the staged rollout of this master plan.” Annastacia Palaszczuk, Premier of Queensland, November 2, 2018. 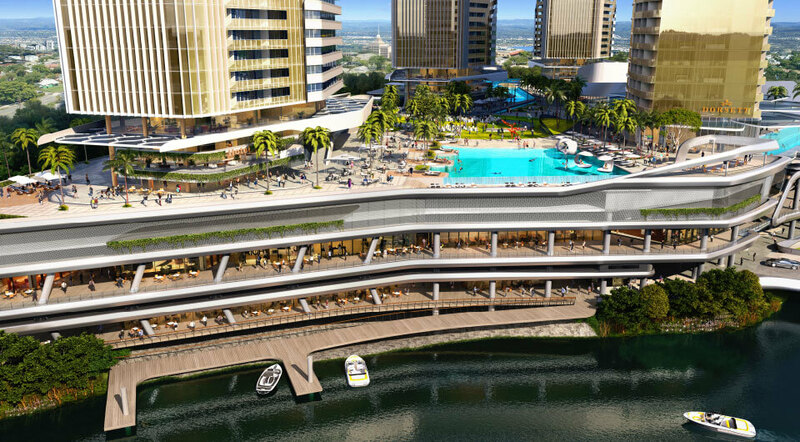 The proposed future vision could see the development inject more than $2 billion in additional tourism investment at The Star Gold Coast. This proposed future masterplan is an extension The Star’s commitment to build the property’s first mixed-use hotel and apartment tower, which they begun constructing with consortium partners in 2018.